Hi! My last two appointments were amazing - 2nd microblading appointment with Jade and a cut and color with Rachael P.
My new eyebrows have given me an incredible amount of confidence and I might just start wearing contacts again. I've been wearing larger glasses to cover up my sparse eyebrows for years. Both Jade and Rachael P. are incredible assets to the Studio 921 team. Pricing starts at $500 and includes a touch up. *$100 is required to book/hold your appointment. This will be used towards your service. 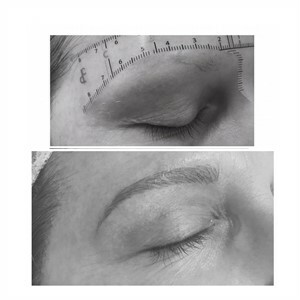 Ideal for those with sparse or thin eyebrows, microblading is a semi-permanent solution that utilizes a special pen to draw your preferred eyebrow shape. It's a low-maintenance, smudge proof solution that will save you time.